Choose File → New Smart Album. In the dialog that appears, type a name, just as you do for a regular album. Select the conditions that must be met for pictures to be included in the Smart Album. Click the + button to add criteria or the – button to remove criteria. As new pictures are imported into your library, those that match these conditions are added to the Smart Album automatically. 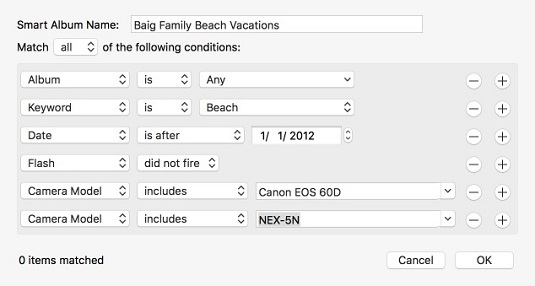 Below, a Smart Album has been set up seeking pictures taken without a flash at the beach since early 2012. The pictures in the album had to be taken with one of two designated camera models, in this case a Canon or a Sony. The criteria were apparently too taxing, because not one photo in this particular collection matched up. A very smart Smart Album.